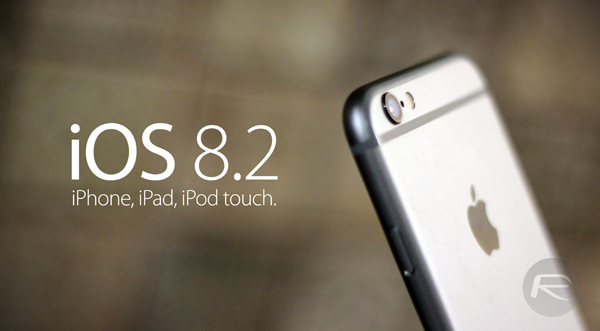 iOS 8.2 beta download just went live for supported iPhone, iPad and iPod touch devices. 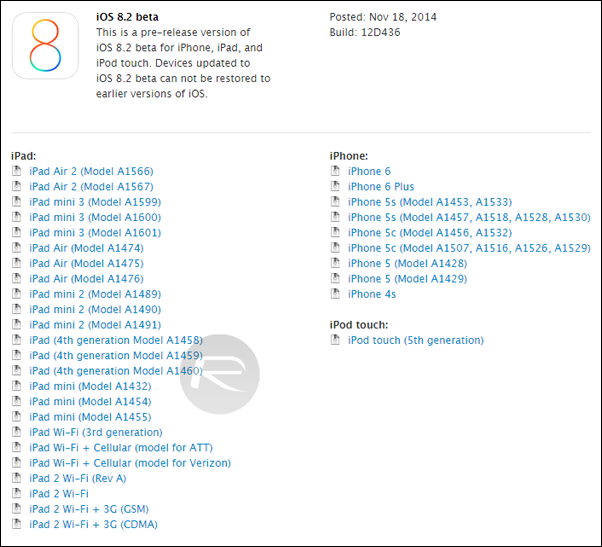 iOS 8.2 beta 1 release comes only a day after Apple released public final version of iOS 8.1.1. With the beta seed of iOS 8.2, Apple is making it clear that the Apple Watch is right on the horizon, and is being prepped for consumer release. While Tim Cook did clearly mention at the iPhone 6 / Apple Watch event that the Cupertino company’s smartwatch will be available in early 2015, it’s the developers which the tech giant eagerly wants onboard to take things to the next level, and the release of iOS 8.2 is testament to that. According to the release notes, iOS 8.2 is strictly focused towards developers so they get their apps ready for Apple Watch, so they work in conjunction with their iPhone counterparts. Apart from being a developer-sided release, there’s apparently nothing new on the consumer end, so don’t expect fancy new functionality or a speed boost, just yet. iOS 8.2 lets you give Apple Watch users access to data and functionality related to your iOS app. The primary interface you can create is a Watch app, which gives users quick, focused ways to access their content without opening your iOS app on their iPhone. Apart from iOS 8.2, Apple has also released WatchKit for developers, which is the starting point for all the Apple Watch apps. It’s evident that iOS 8.2 will be a requirement for iPhones when Apple Watch is released early next year, providing necessary APIs and interfaces required for the smartwatch to work properly with other iOS devices. Carrying a build number of 12D436, iOS 8.2 beta is available for every iOS device that supports and can run iOS 8 and up. If you’re a developer, head over to the iOS Dev Center to download all the necessary bits to get started with the Apple Watch development. But keep one thing in mind, as with every pre-release software from Apple, you will need to be a member of the company’s developer program to take advantage of the whole thing, which costs just $99 per year. Seems that this cydia source has all the best premium tweaks, app and themes that everyone has been talking about lately and it’s all FREE. I must of saved over $100 tonight. If you never added a Cydia source it’s easy. 1. Open Cydia – 2. Tap Sources – 3. Tap Edit – 4. Tap Add – 5. When the box appears, enter the url below and Tap Add Source. Now Go into that Source and install “All Sources”. If this helped you then “Like” this post so others can see this post and benefit from it. Awesome! Thanks for the share bro! I have this Cydia source already installed and it’s definitely the only source I use now since it automatically installs all the best Cydia sources which gives me all the paid tweaks and themes for free. Talk about spam accounts. Not one of them talks about the article. I think it’s rather quick to have a beta of iOS 8.2 but I guess that’s how fast they are moving. Expiry for iOS 8.2 Beta 1 ? I’m trying to update the firmware from iOS 8.1.3 on iPhone 5s to iOS 8.2 beta 2 and keep getting an error 3194 (your device is not eligible for this firmware (I selected the firmware file using the left shift and selecting the file by pressing “Check for upgrade” in iTunes. Anybody know why this is happening? I’m using the most current version of iTunes. Possibly I need to use an older version of iTunes?